There’s an old proverb that says not to put all your eggs in one basket. When it comes to storing survival supplies, this proverb rings true. By keeping all of your supplies inside your home (or at any one location) you are setting yourself up for disaster. This is where survival caches come in. Coming from the French word for “hide”, a cache is a setup that allows you to hide some supplies in a separate location. There’s a lot of strategy that goes into choosing where to put a survival cache and what to put in it. On the one hand, you want your survival cache to be difficult to find so it’s not discovered and stolen. On the other hand, your survival cache needs to be easily accessible, especially if you plan on accessing it during a bug out scenario. Since most people can’t afford to fully stock multiple locations with duplicate supplies (although you should if you can afford to), the question of what goes into a survival cache becomes relevant as well. To help you decide what to put in it, what container to use, and where to hide it, consider some of the following ideas. Guns & Ammo – In a situation that requires you to uncover your survival cache, chances are protection is going to be a priority. Also, since firearm confiscation is a concern, having a few guns and a supply of ammo tucked away that no one knows about is a good idea. As for which types of firearms you should store, AR-15 style rifles are ideal since they can be easily disassembled for storage and quickly reassembled if the need arises. In addition to this, the AR-15 is arguably the most effective combat weapon that is (as of now) legal for civilians to own. If you prefer a more discrete option, handguns are an ideal choice. Food – A generous supply of food is an obvious choice for a survival cache. In the unfortunate event that your main food supply is stolen or inaccessible, you will want to have enough food put away in your survival cache to get by until you can secure another food source. Water and/or a Water Filter Bottle – Even more important than food is water. If you live near a water supply such as a stream or lake, a water filter bottle is a very space-friendly solution. Otherwise, you’ll want to pack away some bottled water. First Aid Kit – Purchase or build a first-aid kit that, at the minimum, includes bandages, a suture kit, wound-closure strips, a disinfectant, and a pain-killer. Firestarter – The ability to start a fire may prove essential if you are required to spend the day (or multiple days) on the run away from your home. Of course, this is just the bare minimum. The rest is up to you. You can use any container you want, as long as it’s water proof (nothing made of wood, which will rot) and very durable (nothing made of cheap plastic, which will crack). It needs to withstand high heat, freezing temperatures, insects, and rodents. 5 Gallon Buckets – A high-quality bucket is both waterproof and airproof and should hold up for a long time. Ammo Cans – Yes, a metal ammo can will rust, but it should still take years before it has any holes in it. Pelican Cases – These are designed to be weather proof and very durable, but they’re a bit pricey. Dry Box – This is a buch cheaper option, which makes me a little wary. All the reviews say it is sturdy and waterproof, but I don’t know how well it would last after being outdoor for months or years. PVC Tube – PVC is designed to be durable and waterproof so it’s an excellent option. Just make sure you use a very good sealant. Of course, there are many other options. Whatever you decided to use, consider sealing it inside one or more contractor bags just for good measure. One advantage of doing this is you make it look like nothing more than a bag of garbage to anyone who discovers it. Add lots of crumpled up newspapers to the bag so it looks even more like garbage. Underground – Hiding your survival cache under a few feet of dirt is probably the most common means of keeping it safe. Of course, burial isn’t an option for everyone. Those who live in a city will find that most of the ground nearby is covered in concrete while the areas that aren’t (such as in a public park) aren’t a really good spot to grab a shovel and start digging. Still, if burying your survival cache is an option then it is one of the best ways to keep it hidden. Along Your Bug Out Route – Hiding your survival cache somewhere along your bug out route is an obvious choice since the scenario where you are most likely to need your survival cache is a bug out situation. The options you have available will depend on the route itself, but so long as you can find a functional hiding spot at some point in the route, storing away a survival cache there is a good idea. Abandoned Buildings – For urban preppers, abandoned buildings make for a great spot to hide a survival cache. Most abandoned buildings don’t see a lot of traffic outside of a few unruly teenagers, so you don’t have to worry too much about your cache being discovered as long as you hide it well. Abandoned buildings also come with the advantage that, if there is a lot of scrap metal lying around, you won’t have to worry about someone with a metal detector being able to find your survival cache. Just make sure you keep an eye on the building. The last thing you would want is to find that the building has been leveled and replaced by a Starbucks. Disguised in Plain Sight – Locations for hiding a survival cache don’t necessarily have to be off the beaten path so long as they are well disguised. For example, you could hide your survival cache at the bottom of a garbage can that you never empty. 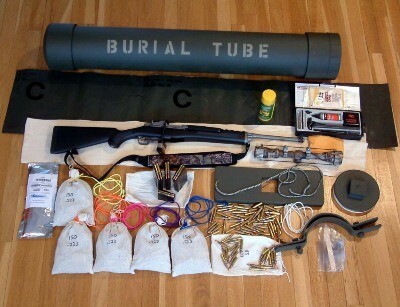 Another excellent option for urban preppers is to hide their survival cache in a storage unit. Since you will have keys to the lock, you won’t be reliant on anyone else to help you access it. Just make sure you grab it quickly when SHTF before thieves get around to cutting the locks off. If storage units and garbage cans aren’t ideal to you, there are still plenty of other places that you can disguise a survival cache in plain sight, and locations such as this are typically great for keeping your survival cache relatively close by.